✅ - 3 port high-speed USB 3.0 extension, support hot plug. ✅ - Support both full-duplex and half-duplex operations. ✅ - Transfer data at speeds of up to 5 Gbps through three ports. That's fast enough to transfer a full HD movie in just seconds! ✅ - With its premium aluminum exterior and compact design, this hub is the perfect partner for your new MacBook and more. ✅ - Automatically adapt to 10M/100M/1000Mbps network transmission. ✅ - Support for Windows (8 / 7 / 10/ME/2000/Vista / XP), surface laptop. 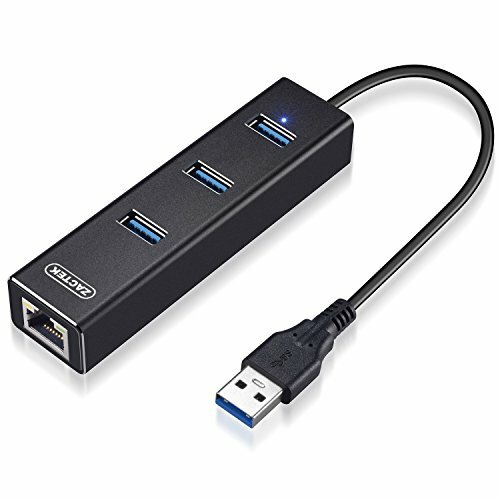 ★【Dual Functions】: USB Ethernet Network Hub with USB 3.0 3 ports + 1 x RJ45 Ethernet Port with attached Cable can save your desk space and the space in your bag. ★【Internet tool】: Allows you to connect to wired networks when wireless connectivity is inconsistent or unreliable. ★【Time saving】: The data transfer speed is up to 5 Gbps, which help you to fast download files, music or movie. ★【Broad Compatibility】: Compatible with Linux, Mac, Chrome and Windows operating systems. Ideally works with OS computers equipped like Notebooks, Desktop PCs, Macbook, Macbook Pro, Mac Pro / mini, iMac, XPS, Surface Pro,Surface laptop. ★【Service】: 12-month warranty and provide friendly, easy-to-reach support. If you have any questions about this product by ZACTEK, contact us by completing and submitting the form below. If you are looking for a specif part number, please include it with your message.